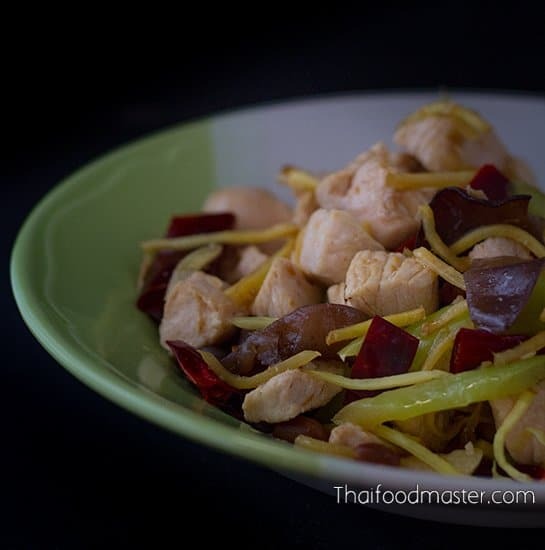 Here is a quick, tasty dish that allows me to be genuinely emotional: from the tears I shed each time I chop the mountain of shallots…to my delighted grin when I behold the beautiful, deep amber color flaunted by the chicken after less than 15 minutes of preparation – a hue that one might expect to see only in a gourmet magazine photo…or on Thaifoodmaster.com. As you read the list of ingredients, you may suspect that there are errors in the quantities. After all, this dish calls for an amount of black pepper that might last an entire year in the average western kitchen. But trust me, the anatomy of the taste in this dish is simple, yet dazzling. Between two layers – slightly bitter, sweet caramel and the saltiness from the fish sauce – a naughty peppery beat pops up and cuts through, draping itself in the savory sweetness of the shallots and a pungent ginger punch. 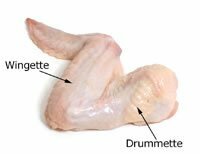 It flavors and colors the skin to perfection, leaving the meat moist, white and easily separated from the bones. 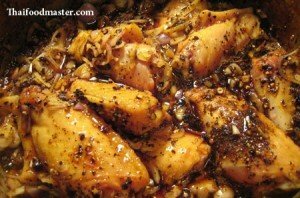 Here is a quick, tasty dish that allows me to be genuinely emotional: from the tears I shed each time I chop the mountain of shallots…to my delighted grin when I behold the beautiful, deep amber color flaunted by the chicken after less than 15 minutes of preparation - a hue that one might expect to see only in a gourmet magazine photo…or on Thaifoodmaster.com. Chop the ginger and shallots; roughly crush the black peppercorns. Moisten the sugar. With a spoon, arrange the sugar in an even layer in a saucepan. Heat the sugar over moderate heat, keeping an eye on it. Once it begins browning at the edges (caramelizing), tilt the saucepan and continue to cook over very low heat - stirring as little as possible - until it takes on a nice, mellow brown color. Be careful not to burn it! Turn off the heat, and carefully add the fish sauce. Be very careful, as the caramel may start to splatter. Add the chicken, shallots, black pepper and ginger. Mix well and bring to a boil. 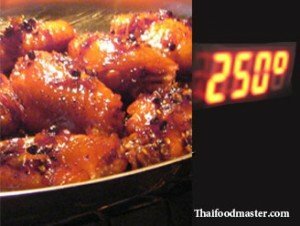 Cover the saucepan and cook for 7-10 minutes or until the wings are completely done; they will take on a beautiful deep amber color. Remove the chicken wings from the pan, and place them on a baking plate. With a spoon, scoop just a bit of the caramel sauce, making sure to include some of the glazed shallots and a couple of peppercorns on each chicken piece. Place the chicken in a preheated oven and grill at 250C (480F) for 5 minutes or until the skin begins to get crispy. Move the wings to a serving dish, drizzle more of the caramel sauce on each wing - and serve! 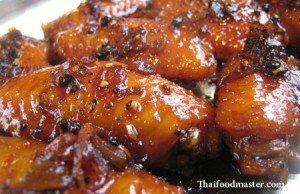 Hmm ur chicken wing looks so yummy..The word CARAMEL in Thai, u can say ปีกไก่พริกไทยดำในซอสคาราเมล Or Peek Khai Prikthai Dam Nai Sauce Caramel. 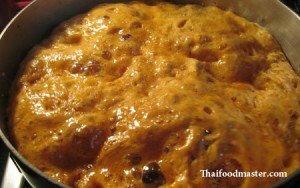 Kalamae is a kind of thai sweet that is like kanom more than food. 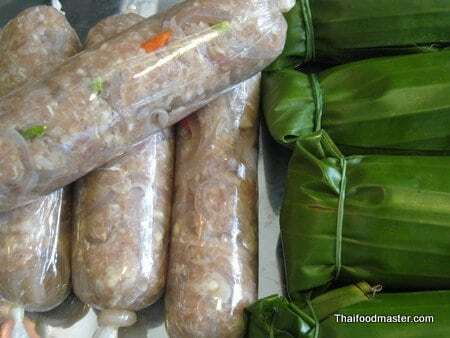 When u said Kalamae, people will think about kalamae that is thai dessert snack. Better say In Sauce Caramel..That makes me feel like a fusion food.. Thanks for the comment, i tend to agree with you and corrected the title accordingly. Hi there..Great site and excellent pictures. 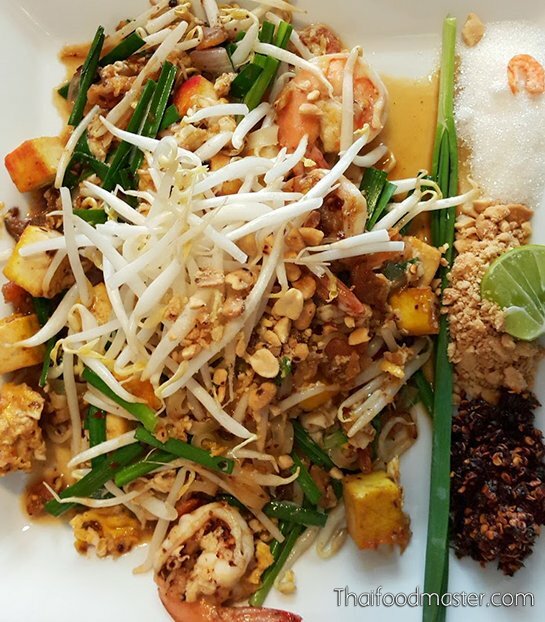 Makes a person very hungry and longing to be back in Thailand again. Anyway i was wodering if you might one day consider a recipe for the thai style dark stock beef noodles..I think its called Khuay-tiew Nur toon?? 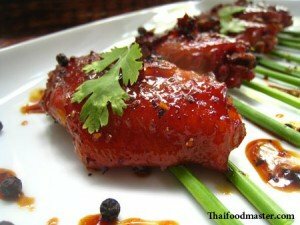 I asked my thai friend how they get that distinct but subtle taste and she was always told it was from the use of pigs blood..which i have my doubts about! 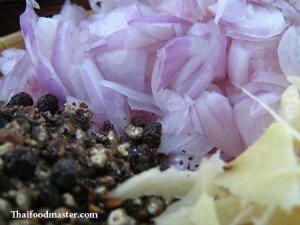 So, from my efforts I would imagine the stock base would have to start from star anise/ five spice and the diced onions cooked until blackened for the dark colour? I imagine using beef ribs on the bone as the meat and adding all the other essentials to that mix? 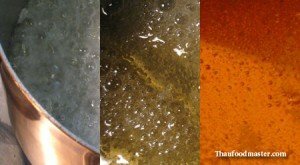 We’ve both experimented while in Australia but neither me or my thai friend have ever been able to get it quite right..
You assumed correct about the spices – garlic, bay leaves, galanga, pepper, mace, cinnamon, star anise are all used. 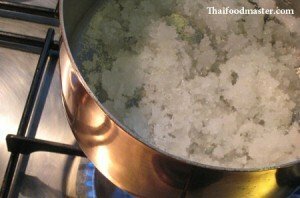 Bones are a favorite addition to many versions of stocks in Thai cuisine, and should cooked on high heat vigorously until they release all the sweetness. 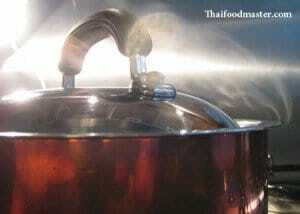 Blood is used as a thickener, but only a spoon or so per serving bowl, and mixed in the last seconds on the heat. but…. not in this dish, but in a type of noodle soup that we call ก๋วยเตี๋ยวน้ำตก guay dtiaao naam tok. If you do not have access to fresh blood, a mashed liver will do the job just fine. chicken liver for chicken stock and pork liver for pork stock etc. as i develop this site i will probably create a “request a recipe” corner! please visit often and let me know if you have other questions ! great recipe, thank you for your wonderful recipes. 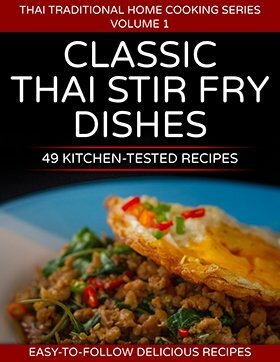 do you have any thai soup recipes coming in the future? i love the hot and sour chicken soup or the shrimp soup. stay tuned rai, this site is new and there are a lot of exciting dishes to come…. Where are you from? It seems u are not a Thai?? I live in Switzerland but I am Thai! This is such mouth watering dish! thats me off to buy some chicken wings right now, don’t think i dare look at any other recipes yet or i’ll be all night in the store. and i think you’re awesome.. 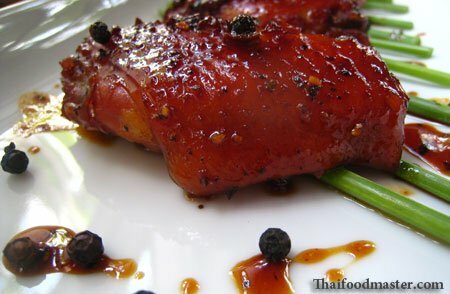 Yesterday I tried to do this dish.It’s wonderful taste and easy to cook.. The recipe and methods are easy to understand and cook..
I’ll try to do other dish. That looks so good. I must try it! Finally, I cook it today .. taste good even I’m not good at cooking. :) Thank you. Hi, my family members are picky eaters n I am glad to chance upon your food blog. This dish is amazing n thanks for sharing. Instead of using white sugar or granulated sugar, will it alter the taste of this recipe if using palm sugar? Also, what is your suggestion for the dipping sauce? any recommendation? thank you. I was wondering about the quantity of fish sauce to use here. Is it really a little more that half a cup?